Innovative Concentrate Fluid, firming Anti Ageing System Body that counteracts the multiple adverse effects caused by biological aging processes, tissue relaxation, free radicals and atmospheric pollutants. Innovative Concentrate Fluid, firming Anti Ageing System Body that counteracts the multiple adverse effects caused by biological aging processes, tissue relaxation, free radicals and atmospheric pollutants. Thanks to the exclusive formulation the products works deep inside to support the repair function of the skin and counter ageing symptoms, contributing to renewed firmness, silkiness and radiance in the body skin. Lay morning and evening a fair quantity of Anti Ageing Body Intensive Cream on the body and massage gently until completely absorbed. Colostrum: is a form of milk produced by the mammary glands. Is rich in antibodies and regenerative factors. Glycosaminoglycans Hydrolized: stimulate a new generation of hyaluronic acid into the derma. Hyaluronic acid is the most important substance inside derma that lead to have a turgid skin. Cyperus Esculentus: polysaccharide from tiger nut, makes the structure of the dermis more strong and elastic. Water and Lentinus Edodes Extract: vegetal product rich in oligosaccharides. 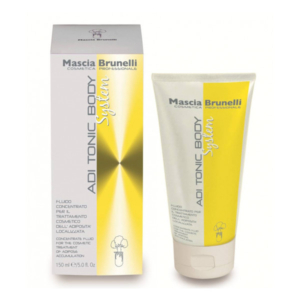 Protects the extracellular matrix of the skin. Matrikine: cellular messenger lead to repair the damage cell structures. Karité Butter: nourishing, anti-wrinkle and relaxing properties, it also improves the absorption of others ingredients present in the formulationNatural Emulsify: Olivoil Wheat derivate emulsify that respects the skin. Natural Emulsify: coming from olive oil and wheat. Helps to restore favorable tissue conditions. Cannabis Sativa Seed Oil: is rich in fatty acids. In particular, is rich in omega 3 and omega 6, the most important fatty acids for the skin. Oily extracted hops: increase blood circulation. Ceramides: improve the natural lipid bilayer of the skin and give more protection improving the structure compactness. Concentrate Fluid with slimming and draining action, with improvement in the circulation, redefining of the silhouette and visible tone. 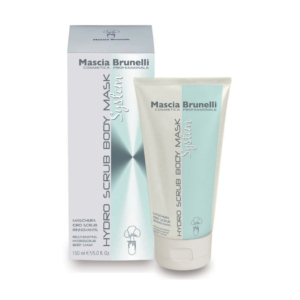 Renewing Hydro Scrub Body Mask for the body with fast acting results on the skin. Its formula is particularly rich in natural active ingredients which act in synergy to produce an immediately visible result. Concentrate Fluid for cellulitis, exerting a strong and deep reducing and reactivating action to improve the signs of any cellulitis type.